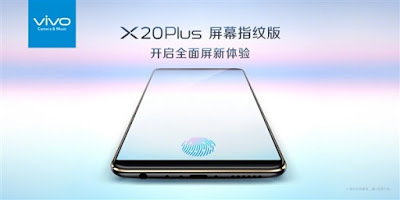 Vivo has officially announced the world's first screen fingerprint phone Vivo X20 Plus UD in China. Vivo X20 Plus screen fingerprint version of the biggest change is the bottom of the screen provides a special "fingerprint lock" module. Its built-in Synaptics (Synopsys International) the world's first screen fingerprint sensor - Clear ID FS9500, designed for full-screen mobile phone design.Under the screen fingerprint is the use of photoelectric reflection principle, identify the fingerprint image, press the fingerprint pattern, you can unlock, pay and other functions. Vivo X20 Plus screen fingerprint version feature a 6.43-inch 18: 9 OLED screen (2160x1080), powered by Qualcomm Snapdragon 660 processor with 4GB RAM and 128GB storage, Runs on Android 7.1.2 Nougat. On camera, it has a 12-megapixel + 5-megapixel Dual Rear camera and a 12-megapixel front camera. Packed with a 3800mAh Battery.